Welding, Soldering and brazing are the most common joining process use in industries for joining same and different metal. Today we will learn about these processes and further we will compare welding vs soldering vs brazing. These all are joining processes but different process uses in different conditions. 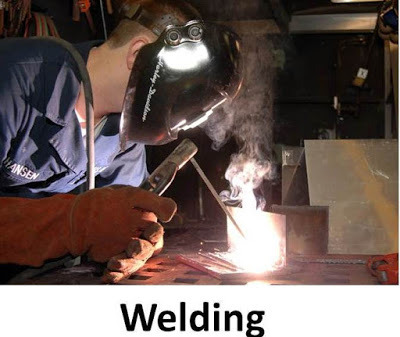 Welding is use in mechanical industries for jointing same or different metals. The main function of welding is to make a strong joint which can carry all mechanical stresses. Soldering are used in electrical and electronics industries. It is use to joint wire to panel. Main function to these processes to make a electrically strong joint which can withstand in any electrical condition. 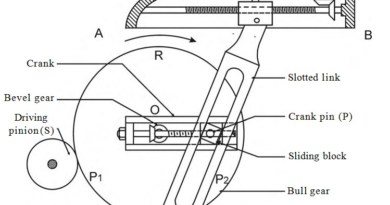 Brazing is use to joint dissimilar metal in automobile and aircraft industries. Welding is a most common joint process in mechanical industries. Two metals joint by using of heat energy with and without filler material or pressure is known as welding. It forms a permanent joint. In this process, both work pieces to be joint are heated until its plastic stage. These work piece bring close and allow to solidify. After solidification a strong joint is achieved. Sometimes filler material is use to joint metal, where filler material placed between work pieces in molten stage. As it solidifies, it makes a strong joint. The heat use to heat work pieces is achieved by burning gases like acetylene or by using electric arc. According to method of achieving heat, welding is divided into Gas welding and Arc welding. Sometimes welding is perform by using only pressure and friction without applying heat and filler material , known as pressure welding and friction welding. Welding is use as permanent fastener, which can stand with working stresses. The main function of welding it to provide the strongest joint, which will not fail during working. A main disadvantage of welding joints is that it is brittle in nature so cannot stand with fatigue stress. One other big problem occurs due to uneven heating and cooling which increase internal stresses. 1. It is more suitable permanent joint. 2. No hole is required, so stress concentration is less. 3. No filler plate requires so overall weight of work piece is less. 4. Welding joints have high efficiency. 5. The rate of joint is high compare to other joining processes. 1. The welding joints are brittle witch cannot withstand with fatigue load. 2. Due to uneven heating, internal stress develops in welding. 4. It is difficult to inspect. 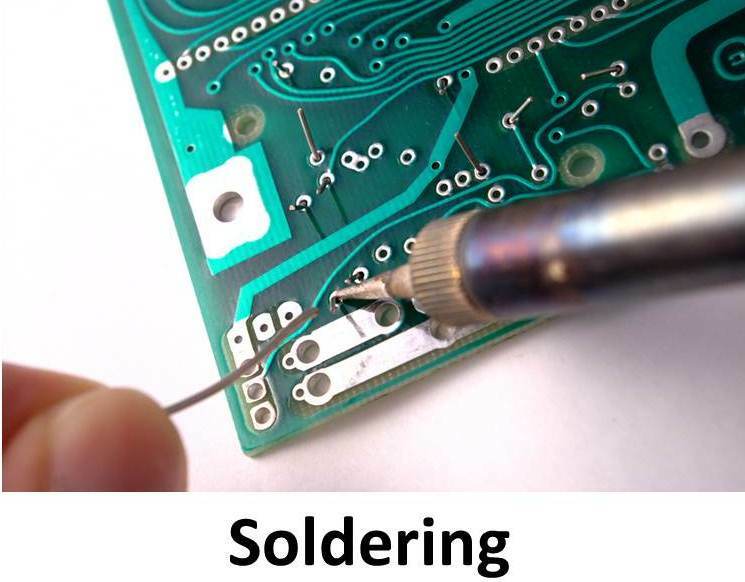 Soldering is almost similar to welding except it use to joint wire in electrical and electronics industries. In welding process, a strong joint is making between two plates by using heat. This joint withstand with high mechanical stress and load. It is use to make good mechanical connection. Soldering is same as welding except it is use to make good electrical connection. In the soldering process solder is use as the filler motel to join the wire or other small electrical component like resistor, capacitor to panel. Solder is a soft alloy of lead and tin. It is high electric conductor and has low melting point. A soldering iron is use to heat up the filler metal witch melts the solder over the joint. Soldering iron tip is use to place the solder over joint. As the solder solidified, it makes a good strong joint between the electric components lik capacitor, resistor to the panel. Solder is a mechanical connection. It’s main function to provide a good electrical connection between these components. Soldering is use widely in electronics industries. 1. it require less heat. 1. Solder is good electric conductor so make a good electrical joint. 3. It does not require skilled labour. Brazing is the most common joining process to join dissimilar metals. It is similar to soldering except high temperature is use in brazing. 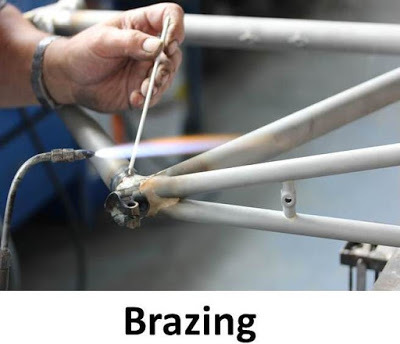 Brazing is a joining process of metal which is done at the lower temperature of melting of work piece. In this process silver based alloy is use as the filler metal which melting temperature is above 450C but below the melting temperature of base metal. The molten metal allow to flow between gapes by capillary action. One big advantage of this joint is gives similar strength for similar and dissimilar base metal. Brazing is done into open atmosphere which can cause of forming oxide of metal. A flux is use to prevent the joint by oxygen. 1. It does not melt base metals. 2. Both similar and dissimilar metals can join. 3. It does not form internal stress due to uneven heating. 4. It can use in mass production. 5. Brazing produces a clean joint. It requires high temperature above melting point of base metal. It is above 3000C. It requires temperature below melting point. It is up to 800C. It requires low temperature below 450C. It forms strongest mechanical joint which can withstand with high working stress. Brazing joints are stronger than soldering but weaker than welding. Less skill require to join metal. Preheating of base metal does not require. Preheating of base metals require. Preheating of base metal is essential. The properties of base metal may change. No change in mechanical properties. It is not required to clean the work piece before weld. The work piece is clean before joining. It is essential to clean the work piece. Today we have discussed about welding, soldering and brazing. We have also compared brazing vs welding vs soldering. If you have any query regarding this article, ask by commenting. If you like this article, don’t forget to share it on social network. Subscribe our website for more informative articles. Thanks for reading it.